The Persimmon plans for 300 dwellings, as transposed on aerial photo, to give an idea of the scale of the development. Egress onto Platt Lane (Park Road) and the Chequerbent roundabout - making a sixth junction at this congestion 'pinch-point' and accident blackspot. 1. Bolton Council Core Strategy. The Local Authority has a duty to form plans relating to housing need and allocation in line with its wider social, economic and resource management - and government policy. This is a long, consultative process. No sooner was the 2005 UDP (Unitary Development Plan) adopted than planning began for future years. From 2005 onwards 'Housing Land Availability Reports' - a comprehensive review of potential sites across the borough which are prioritised 1, 2, 3 for suitability and need - fed into the 'Local Development Framework' planning process. The latter stages in the presence of the Planning Inspector and interested parties such as the Council, Developers and Residents Groups such as S.W.A.N. Sites across Bolton are allocated for both housing and employment and targets set. In 2011 Bolton's 'Local Development Framework' and 'Core Strategy' (2011-2026) was adopted. However, with a new Government came new planning policy and the 'National Planning Policy Framework' (NPPF) was introduced with its "presumption in favour of sustainable development." This necessitated that councils such as Bolton reviewed their 'Local Development Framework' (LDF) - this has become known as the Local Plan - to ensure its soundness. The review of the adopted 2011 LDF took place during 2013 and 2014. There was particular attention paid to there being a 5-year supply in line with 'NPPF' guidelines. In the context of this new consultation, proposals were put forward by developers for development of key areas of open land around Westhoughton (including Lee Hall). A 'priority 3 site', Lee Hall remained 'protected open land' within the review and outside of any allocated sites in the reviewed plan - important in maintaining the "free-standing status of Westhoughton within the borough". Following the Local Plan review, in September 2014 the independent Planning Inspector was able to sign off Bolton Council's Local Plan as being 'sound' (subject to some minor revisions). The Allocations Plan was formally adopted by Bolton Council on 3rd December 2014. In light of this, we believe that any planning application for Lee Hall would and should be rejected as it would contravene and undermine the Council's Core Strategy. One of the arguments used by the developer was regarding at lack building during the years 2008 to 2011 (under-supply). Though having sites allocated, developers simply stopped building as the economy entered recession and credit which had been driving the housing market dried up. The previous housing bubble peaked and developers had been unable and unwilling to adjust to new market conditions. Had there been real demand for housing houses would have been build at a price the market could bear. The issue of numbers was addressed in the Inspector's Report (Sept 2014). It has been acknowledged that during previous years Westhoughton had borne the brunt of development within the borough, there is a general sense amongst residents that Westhoughton has been over-developed and both infrastructure and service provision are already stretched. Within the developer proposal is the suggestion that the council would see a £3m bonus paid (for the 300 homes) as well as an income of £0.5m from extra Council Tax - the former through the Government's 'New Homes Bonus Scheme.' There may be additional money to support local improvements - Community Infrastructure Levy (formerly Section 106 money). In our experience additional money does always not end up being spent in the locality and such promises are often not kept. Money tends to disappear into a borough-wide pot. More recently developers have sought to get out of such commitments, and the government has moved to excuse developers of this commitment (brownfield). In 2008 £1m was received by Bolton Council from Sainsbury's for the release of a covenant ensuring Westhoughton Cricket Club land could only be used for leisure, this went into the 'Capital Receipts Pot' - Westhoughton does not always benefit directly from extra money that comes from development. Such promises should be treated with a healthy skeptism. A very significant issue would be traffic in and out of Westhoughton at peak times. Further traffic onto Chequerbent will increase journey times impacting on the whole of the town down to Daisy Hill. Any new road onto Chequerbent would merely bring more traffic onto the roundabout - already an accident blackspot - and would open up Lee Hall to more development. There are the significant new developments around Gibfield and Atherton from Atherleigh Way that would also be drawn to Westhoughton. Even within the current allocations in the 'Local Plan' there doesn't seem to be any provision for improvements to infrastructure (or services for the growing population). Northern Rail via Daisy Hill will remain inadequate for the size of the town. Electrification of the Westhoughton line may bring improvements though this remains unclear and not something to reply upon given ongoing issues over rolling stock and timetable capacity. Much ecological work was done during and for the Lee Hall Enquiry in the late 90s. This will be updated. Concerns have been raised that initial assessments on the site were done at the time when there was less wildlife about - this might give a false impression of the areas ecological worth. 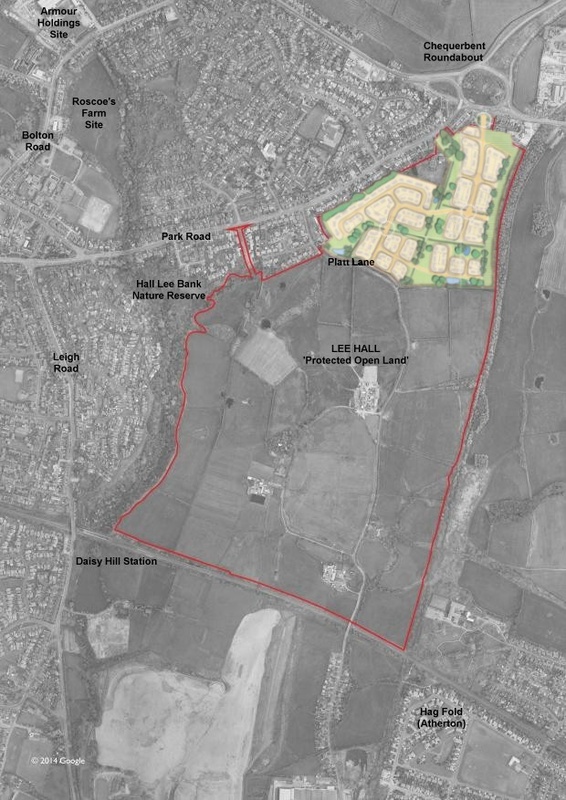 Building on Lee Hall could affect land-soak and impact upon the immediate area, and specifically the Local Nature Reserve (LNR) at Hall Lee Bank Park. We would ask whether this has been fully assessed? After the consultation an Online Petition was set up by a Councillor asking Bolton Council to turn down the application. Whilst the application had not actually come through, the publicity has helped raise awareness of the plans. The petition has received a considerable and significant amount of support - 1,600 signatures and hundreds of comments. Caveat: Whilst some weight should be given to this public engagement, it is important to point out that in planning terms petitions only count as one objection - similarly standardised objection letters are counted as one. People who do feel strongly enough to fill in a petition, should act and put their thoughts and any objection to the Planning Department as part of the consultative process. Only then would their voice really count. It was observed at the Carnegie Hall consultation that residents were asked to fill in forms by the Developer - many did. We are not aware that copies were made for residents' reference. The exercise was to gather information to 'support' their plans. Those that did complete forms would be best served in making those concerns directly to the Planning Department at during the planning application consultation period. As the population grows we need more homes, and house-building is often seen as a way of stimulating the economy. Politically all main parties have committed to allowing significantly more building - that would impact on existing strategic plans and land allocations. There is a new Greater Manchester Authority (AGMA) that that will in time (from 2017) be charged with overall control of planning - it is a body that has committed to more house-building as a way to grow the region's economy. The concern would be that decisions become political rather that based on sustainable planning reasoning. Housebuilding tends to be funded by debt (mortgages); at current house price levels, and with the global economic uncertainties, it is hard to see whether there is the appetite for even more personal debt - hence the variety of tax-payer funded schemes to stimulate the stuttering housing market (the term 'affordable' tends to be used in terms of subsidised or deferred debt ('Help-to-Buy' schemes). Changes to local infrastructure payment levies (formerly Section 106 money) have meant reduced prices on brownfield site developments is at the expense of funds meant to fund local improvements. For reference, this is the S.W.A.N. objection to the Lee Hall 300-dwelling planning application (94696/15) as submitted by e-mail (17/8/15).